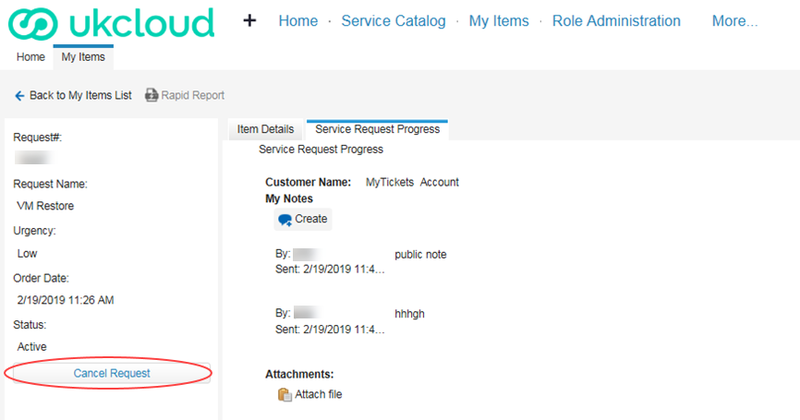 The My Calls area of the UKCloud Portal is a one‑stop place to raise new support tickets (incidents and requests) with UKCloud and monitor existing tickets. This guide is intended for any UKCloud Portal user who wants to use My Calls to raise or monitor a support ticket. 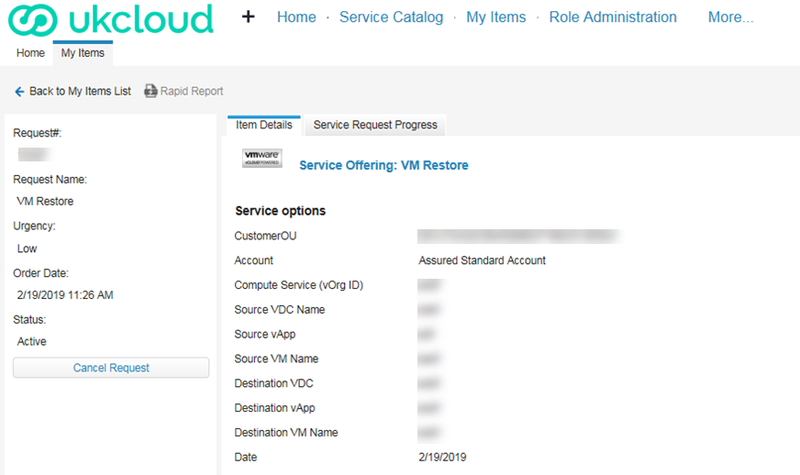 To complete the steps in this article, you must have access to the UKCloud Portal with the appropriate Portal permissions for Support. The tasks you can perform will depend on the level of permissions you have. 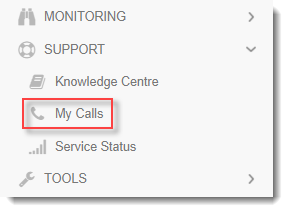 In the Portal navigation panel, expand the Support option and select My Calls. For additional security, re-enter your UKCloud Portal user credentials to access My Calls. Outstanding Items lists the support tickets (incident and service requests) that you can view, depending on your permissions. You can also see support tickets by selecting the My Items tab. Report List provides customer related reporting around tickets (coming soon). Log an Incident using Template provides templates for you to use to raise tickets. You can also see incident templates by selecting the Service Catalog tab. Top 5 Service Catalogue Offerings lists the most popular service catalogue offerings to provide a quick way to raise a request. To see all request offerings, select the Service Catalog tab. 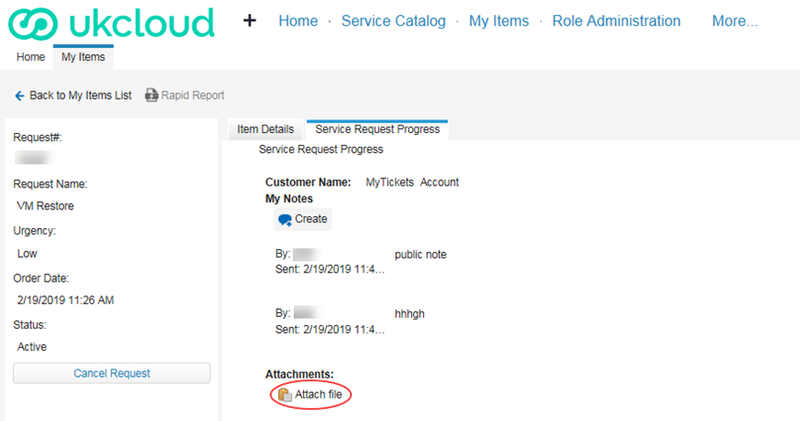 If you want to request a new service, make changes to an existing service or request information, use the Service Catalogue to raise a service request. If you need to notify UKCloud of an incident, use an incident template to raise an incident. In My Calls, select the Service Catalog tab. Search the Service Catalog for the request offering or incident type you'd like to raise. You can browse by product type or most popular or enter keywords to search for. There is a generic incident template if you cannot find anything that matches what you're looking for. Select the request or incident form that you want to use. Complete the fields in the form with as much information as possible so that our Support Team can address your ticket promptly. When you're done, click Review & Submit. You're automatically subscribed to any tickets that you create. After raising a support ticket, you can view the ticket to monitor progress, add more information, add attachments, close or cancel the ticket. The actions you can perform on a ticket depend on your Support permissions. You will always be able to update support tickets that you have raised. If you have the Account Tickets or My Calls Admin permissions, you can also view and edit tickets raised by other users on the account. In My Calls, select the My Items tab. Find the ticket you want to view either by browsing through the list of tickets or by using the Search field. You can also filter by incident (Issue), request or active tickets. When you find your ticket, click the Summary. The Item Details tab shows the information submitted in the request or incident. Select the Service Request Progress tab to update the details of the ticket. To add an update or reply to a message from our Support Team, click Create under My Notes, add your updates. To add an attachment, click Attach Files. For security purposes, some file attachment formats are not accepted. To cancel a ticket, select Cancel Request in the left-hand panel and click Yes to confirm. If you have the My Calls Admin Portal permission, you can manage the permissions level for other My Calls users across your account. In My Calls, select the Role Administration tab. From the list of users, select the user that you want to edit. You can filter the list of users or use the search field to find a specific user. Select the permission level you want to apply to the user: My Tickets, Account Tickets or My Calls Admin. The options offered will depend on the current role assigned to the user. 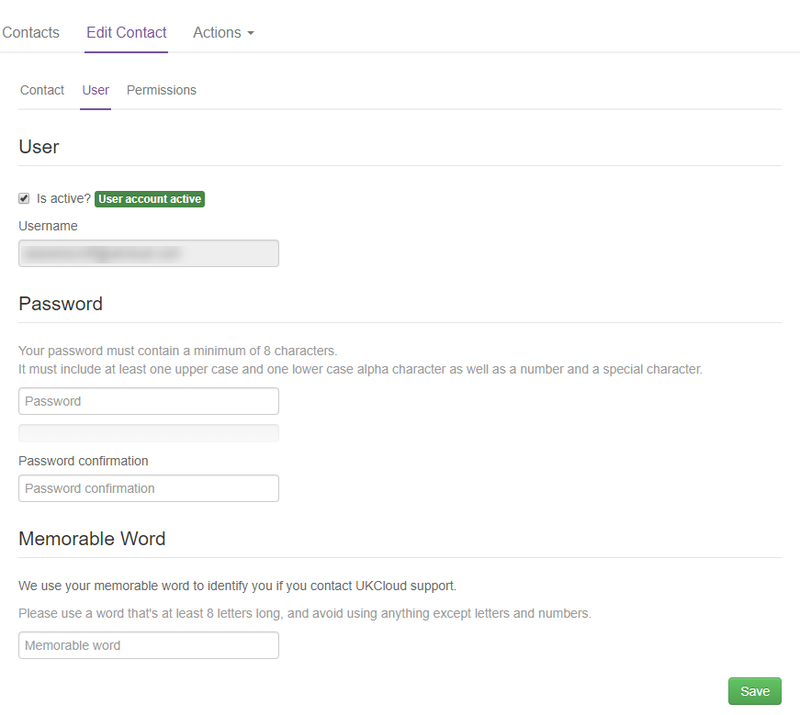 Each user can have only one permission level, so the role you select here replaces any previous permissions. For details of what the different permission levels mean, see the table in the Intended audience section. You can enable new users on your account with access to My Calls. 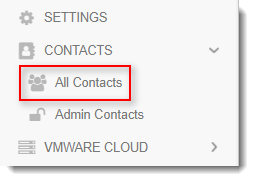 From the Actions menu, select Add new contact. On the New Contact page, provide the user's name and contact information, then click Save.
! [NOTE] If you receive an error message, contact UKCloud Customer Support at support@ukcloud.com. After you've created the user account, select the User tab, select the Is active? 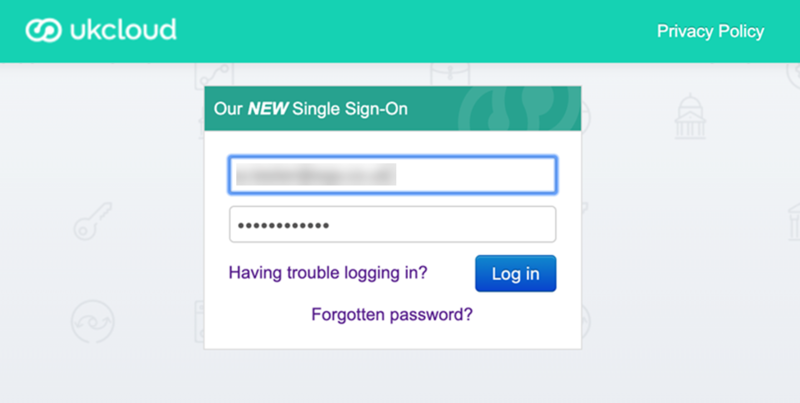 check box, provide the user with a password and memorable word, then click Save. It takes about 15 minutes for the user to be available within the Portal. To provide the user with access to My Calls, you must raise a service request using the Setting up a user in My Calls offering in the Service Catalogue. For detailed steps, see Raising a support ticket. When UKCloud Support have set up the user in My Calls, you can manage their permission level to give them the appropriate access. For detailed steps, see Managing My Calls user permissions. If you need to access older tickets, created using the previous version of My Calls, you can use the My Calls Archive. To raise new support tickets you must use the new My Calls. 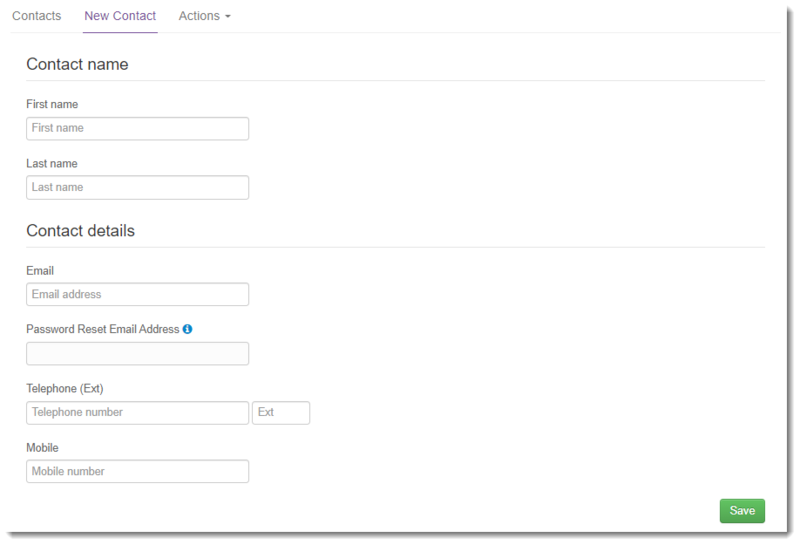 In the Portal navigation panel, expand the Support option and select My Calls Archive. For more information about what you can do in the UKCloud Portal, see the Getting Started Guide for the UKCloud Portal.